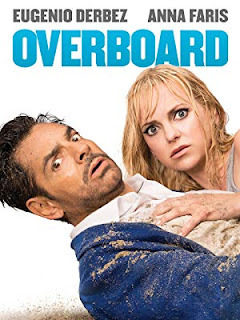 Overboard is an award-winning comedy. If there are differences between this and it's predecessor, they aren't ones that we recall. This is probably a good thing. We love Anna Faris (Kate Sullivan). However, there wasn't an incredible amount of funny material. There were instances when we asked ourselves how one with amnesia would react to the presented situations and we concluded that we are not sure. But, the movie kept our attention (not an easy task), even when the workers sat around bein' dumb. Leonardo (Eugenio Derbez) was delightful in his awfulness, then, in his awesomeness. We won't give away the ending. But, this was an enjoyable ride. It was. Hey, I want you to take a bath Olivia! Use soap. This is crazy...and probably illegal. Everyone wants my life because it's meaningful. I need a drink. Lots of them. I'll be the pretty face...obviously. Look, I love you. I love you a lot. But, you can be unpleasant. What animal do people say you look like? ...he was murdered by a shark. Maybe next time I ask you to comit a crime, you won't fight me on it. Taglines: A riches to rags story. If only he could remember it.